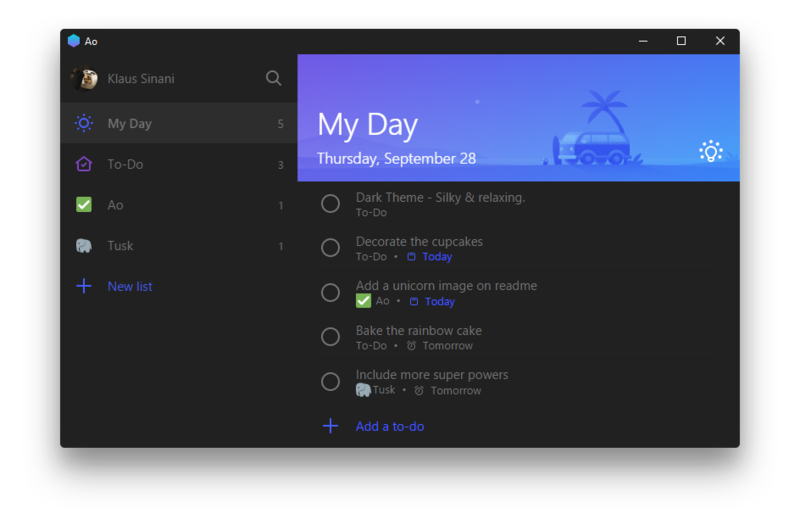 Ao is an unofficial, featureful, open source, community-driven, free Microsoft To-Do app, used by people in more than 120 countries. Read this document in: Deutsch. The version available on AUR may not be the latest. If that is the case, please consider downloading directly from the Github releases page. Custom Shortcut Keys - Navigate to ~/.ao.json or press Cmd/Ctrl . to modify any shortcut key. To reset delete ~/.ao.json & restart the app. Update Notifications - Customize the app&apos;s update checking frequency. 40+ local keyboard shortcuts. Toggle anything in a flash. Access Ao at any moment from anywhere within your operating system. All global shortcuts can be customized to match your own preference through the configuration file ~/.ao.json. Tusk - Refined Evernote desktop app. Ao is an unofficial, open source, third-party, community-driven, free app and is not affiliated in any way with Microsoft.